The journey to the NHL is a remarkable one, and as the resident writer for the NHL Alumni Association, I have heard many wonderful stories and met many amazing people. Every player that reaches the world’s greatest league travels a unique path and it is an honour to share their stories here as the NHL Alumni Insider. This particular interview is personally special for me though. For the first time, I am welcoming a close friend into Hockey’s Greatest Family - Bryan Helmer. An undrafted free agent, Bryan’s invitation to the New Jersey Devils training camp in 1993 would mark the beginning of a 20-season professional career. Going on to play 146 regular season NHL games with the Phoenix Coyotes, St. Louis Blues, Vancouver Canucks and Washington Capitals during that time, Bryan announced his retirement this summer. In becoming an assistant coach with the Ontario Hockey League’s Peterborough Petes, he leaves the game as a three-time Calder Cup champion and one of the all-time greatest defensemen in the history of the American Hockey League. Born in Sault Ste. Marie, Ontario and raised in Winchester (which is about 40 minutes East of Ottawa), I began our conversation by asking Bryan if he ever envisioned that his invite to that 1993 training camp would lead to a 20-season career and numerous accolades. A Montreal Canadiens fans growing up, the 1994 lockout provided Bryan a unique opportunity to meet and work with one of his idols, and a fellow Winchester native, Larry Robinson. As Bryan’s career and confidence continued to grow, so too did his offensive numbers. Building on his rookie season (93-94), where he scored 4 goals and added 19 assists in 65 games, he scored 14 goals and had 63 points by the time his fifth season ended; his last in Albany. 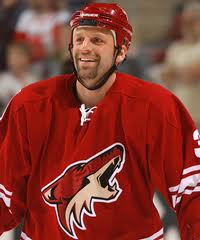 Signing as a free agent with the Phoenix Coyotes organization for the 1998-99 season, he would fulfill the dream of every young hockey player, putting on an NHL jersey and stepping onto the ice for his first regular season NHL game. As was the case with the start of Bryan’s professional career, that came in an unexpected fashion as well. Part way through his first NHL season with the Coyotes, Bryan was off to St. Louis, where he became the defense partner of a young man that had already established himself as a powerful force to be reckoned with in the NHL, Chris Pronger. “When you play with Chris, you are playing against the opponent’s top lines. I think every time we were on the ice I was thinking ‘Go down his side of the ice and stay away from mine,’” Bryan said with a laugh. Being a fan of the game and having the shutdown role with Chris in St. Louis, provided Bryan many memorable nights, but one in particular stands out for Bryan. Every hockey fan’s dream, but every defenseman’s nightmare - trying to shut down the Great One himself, Wayne Gretzky. Becoming part of the Vancouver Canucks organization in 2001, Bryan split his time between Vancouver and their AHL affiliate in Winnipeg (the Manitoba Moose). It would be Bryan’s only time spent in Canada as a player, so I asked what that experience was like. While that Detroit-Vancouver series would be his only visit to the NHL playoffs, he was no stranger to playoff hockey. When the games meant the most, Bryan had the ability to lead his teams deep into the AHL playoffs. One of his many AHL records is for games played in the playoffs, which reached 159 games by the end of his career. After being part of a Calder Cup championship in Albany during his second year as a pro, he would lift the Cup as the captain of the Hershey Bears in back-to-back seasons in 2009 and 2010. As a friend, it was strange to say ‘looking back on your career’ to Bryan, but there is little doubt a call from the AHL Hall of Fame will come one day. He is the all-time leader for points scored by a defenseman (564 points), assists (433) and he is third on the all-time list for games played with 1,117. When he broke John Slaney’s point record while with the Oklahoma City Barons, the Hockey Hall of Fame called asking for some of his equipment from the record-breaking game. Moving on to life after hockey is difficult for every player in varying degrees, but knowing Bryan, I know that he didn’t leave anything in the tank at any point in his career. He gave it his all for 20 seasons and it was time to move on and start the next chapter in his life and hockey career - for himself and for his family. As his playing career ends, a new chapter begins, and in just a few weeks time, Bryan will be behind the bench as an assistant coach with the Peterborough Petes. His experience as a player will enable these young OHL players to work on their game and perhaps fulfill their own NHL dream one day. The support of Pam, his son Cade and daughter Rylan has meant a lot to Bryan and contributed to his success on the ice. Hockey fans are aware of their favourite player’s hockey life, but real life happens as well. During his career, he has watched his children arrive into the world and grow into amazing kids. He has shared his success on the ice with his family, but more importantly, shared in the love that abounds in the Helmer household. Here’s to a great friend, an awesome dad, an amazing hockey player and a future AHL Hall of Famer - Welcome to the NHL Alumni and Hockey's Greatest Family Bryan!